So many of us have a favorite decade. It could be the 1920's and the flappers or maybe the 1950's with hot rods and ponytails. For even some, it might be the 1980's and all the neon colors and member's only jackets. No matter what decade you love, there are cross stitch patterns out there to celebrate it. You may even be so lucky as to find patterns from that time period, especially if it has been within the past 30 years. The patterns below are just a few samples that celebrate the memories of yesteryear. When you think of the 1920s what is the first thing that comes to mind. If you are like most, you think of a flapper. The good-time girl who was the life of the party. 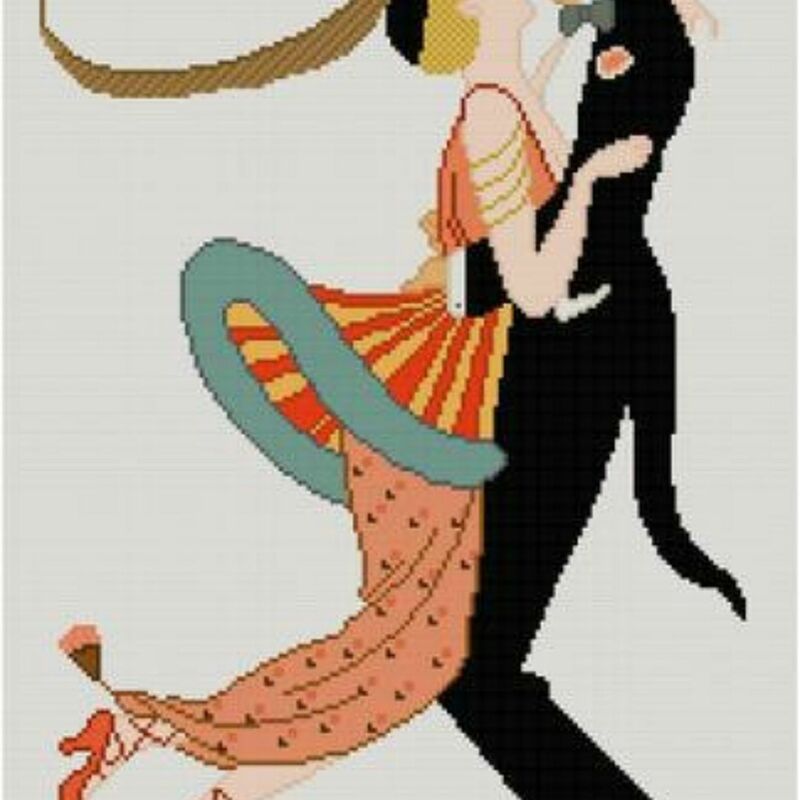 This beautiful couple by Whoopicat is just one of the 1920's inspired patterns on their website. The pattern shown here is an adaptation of the famous fashion illustration by George Barbier. Be prepared to spend a lot of time looking at all the patterns in their shop. They are all breathtaking. You can purchase this pattern, as well as others in their Etsy Store. The 1930s brought the great depression and popular culture reflected that rough time. We see extremes from the practical and downtrodden to the over the top and glamorous. A popular image during this time was dressing animals up and putting them in human-like settings. These photos were made by photographer Harry Frees. He insisted that no animals were harmed in these photos. Penumbra Charts created a cross stitch pattern from these photos. The final project would be wonderful in a kid's room or nursery. She also has other history-themed patterns for instant download. Moving on to the 1940s and WWII. We began seeing iron on patterns from Aunt Martha and Vogart. You can still find these patterns online (scanned) or at antique stores. They are still as usable as they were in the 1940s. Many of the patterns were military-related as you can see from the photo mentioned here. This pattern is a mix of embroidery and cross stitch. It is an Alice Brooks design and is a Day of the Week pattern featuring a sailor having a little bit of a rough time getting through daily activities. This little guy is just as relevant and cute today as he was in the 1940s. Blondie's Spot has so many vintage patterns ready for download from crochet, knitting, embroidery, and cross stitch. They do mention that they are public domain patterns and are not breaking copyright rules. The 1950s brought us the teenager. The war was over and life got back to normal. Kids discovered rock n' roll and we had disposable income. 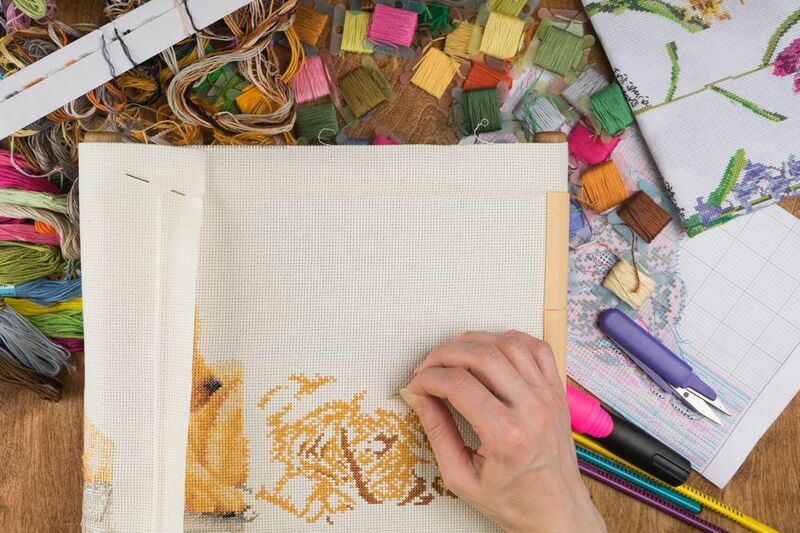 New York Needleworks creates the most beautiful silhouette cross stitch patterns. They range from easy/beginner to advanced stitching, The 1950s Kissing Couple pictured here is a perfect example of the average teenager during that time. It was all about fun, hanging out with friends and of course, stealing a kiss or two. The 1960s and 70s were all about flower power, peace, and love. Big sad-eyed girls in wild colors were all the rage. The big-eyed prints didn't just stop at little girls and boys. Animal prints were equally as popular. Once again New York Needleworks is feeling the retro love with this Retro Cat with Flowers pattern. This kitty would look adorable in a little girl's room or playhouse. It would also look great on a tote bag for the cat lover in your life. They offer up 2 other kitty patterns to make a fun set. The 80s brought us neon colors and parachute pants. The fashion of the 80s was not kind. The 80s cross stitch patterns focused on country style and a lot of teddy bears. Lucky for a lot of us, the new designers have steered clear of those two things and went with more fun memories of the 80's like Pinoy Stitch did. They also have several other decades. Why not stitch up one for each person in your life, from your granny in the 40s to your brother in the 80s. Regardless of what decade you are fond of, there is a pattern out there to represent your love for it. If you are really lucky, you might be able to find original patterns from that time period. Let's meet back here 10 years from now and see what this decade had to offer for us. Happy cross stitching!